Founded by Brian R. Murer, DC/SMTh and Jona Beczkiewicz Kerr, SMTr, Evolutions Institute of Soma Instruction (EISI) was created to share the groundbreaking and innovative manual therapy and corrective exercise techniques of Guy Voyer, DO. In addition to providing manual and corrective exercise therapy to patients and clients, the goal of Evolutions is to train the next generation of therapists and trainers in the Voyer paradigm. Click here to see the schedule and register for classes! Your course, Your schedule, Your way! Either come to beautiful Bloomington, Indiana or we will come to you and experience a truly personalized weekend of courses in the Guy Voyer, DO paradigm. Call the Evolutions Institute of SOMA Instruction at 812-369-4770 for more information. Manual medicine and rehabilitation specialist Dr. Brian Murer does not believe that any problem in life has a singular cause or a singular solution. He brings a systems approach to every aspect of his life. This is especially true with regards to his work as a manual medicine practitioner helping people recover from injury, chronic and acute pain. Murer works within the emerging paradigm of bio-tensegrity, particularly with respect to fasciae. He works almost exclusively with the tools and techniques taught by Guy VOYER, DO. Dr. Murer is trained and licensed as a chiropractor, attending Parker College of Chiropractic in Dallas, Texas. A former national caliber hammer thrower at Southern Methodist University and 1996 Olympic team alternate, Murer brings a wide and varied approach to his treatment and teaching practices. Before pursuing a career as a manual medicine therapist, Murer coached at SMU and apprenticed under world-renowned coach Dan Pfaff at the University of Texas. He went on to tutor the 2000 Big Ten Champion in the hammer throw and had NCAA qualifiers in the javelin and hammer throw events as a track and field coach at Purdue University. An advocate of lifelong learning, Murer is certified in neuro-functional acupuncture from McMaster University and studied many other established soft-tissue techniques before discovering the work of VOYER. Murer has completed VOYER’S Soma-therapy course (SMTh), currently studies his Soma-training methods, and is working toward his diploma in manual osteopathy under VOYER. Dr. Murer was the first practitioner in Indiana to study VOYER’S ELDOA exercises and bring them to Bloomington. 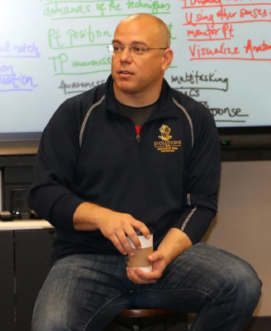 An experienced teacher, Murer has coached track and field at the youth, collegiate and professional levels and is a sought-after guest lecturer, speaking at universities and in seminars throughout the country. Therapeutic exercise specialist and classically trained violinist (1994 B.M. Performance CCM, University of Cincinnati), Jona Beczkiewicz Kerr believes that specific, high quality exercise can reduce or eliminate the effects of repetitive stress, a highly common and mainstream cause of physical pain and disorders. In collaboration with Brian Murer, DC/SmT, Kerr has worked with hundred of clients and patients, including world-class musicians, dancers, and athletes since 2012 to rehabilitate and restore their physical health to optimum levels. Passionate about learning and teaching, Kerr employs a revolutionary exercise methodology developed by the world-renowned doctor, Guy VOYER DO, with whom she regularly studies and is certified. In May 2016 she will have completed VOYER’s three-year Soma Training Program and will continue her studies in Soma Therapy. Having struggled with repetitive-stress induced arm problems from violin studies, Kerr believes that due to the extreme physical nature of performance, musicians (particularly students) should have access to high quality exercise instruction to mitigate performance related repetitive stress. As a result and in collaboration with the Indiana University Jacobs School of Music, Kerr founded one of the only corrective and therapeutic exercise programs at a major music institution. Now in it's fifth year, the program has successfully helped countless students overcome and prevent injuries. Kerr is invited regularly to present lectures and workshops at universities and conservatories, music festivals and national conferences, including the upcoming American String Teachers Association National Conference in Tampa, March 2016. This video clip is from a presentation I did for the Jacobs School of Music at Indiana University. The presentation outlined how periodization and recovery strategies used in high level athletics can reduce repetitive stress injuries and increase the quality of practice and performance for musicians. During the presentation, we gave a brief, but powerful introduction to the ELDOA. The presentation created awareness in the students of just a few of the physical elements that can be changed by these exercises. Jona Kerr, co-founder of EISI, offers weekly classes to students of the Indiana University Jacobs School of Music. The ELDOA classes are not only changing the lives of these students, but they are changing the culture of the classical music world. In 1999, a small group of students in Canada took the first ELDOA class in North America taught by Guy VOYER, DO. During those early years, word of the ELDOA spread slowly. It was usually taught to VOYER’S osteopathy students and a small group of students who were dedicated to the process of learning his exercise methodology. Today, thanks to consistent results and the uniqueness of its approach, the ELDOA method of exercise has slowly taken hold in high level sports therapy and training. The ELDOA are now used in all major North American professional sports as well as in many Olympic training camps and NCAA Division 1 programs. ELDOA is rapidly gaining prominence within the highest echelon of therapists and trainers who see it as an indispensable tool to help clients and patients. ELDOA (Étirements Longitudinaux avec Decoaptation OsteoArticulaire) is a French acronym that translates to stretching of osteo-articular joints in the longitudinal axis with de-coaptation. The ELDOA are a series of precise movements developed by Guy VOYER, DO to create space in a joint, returning normal physiological movement to the articulation. VOYER developed the ELDOA over 30 years ago with the original intent of curing the chronic back pain epidemic. While the ELDOA initially proved itself as a great tool to combat chronic and acute back pain, VOYER soon discovered that his patients using the ELDOA also experienced benefits that extended well beyond back pain including improved visceral function and an overall improved sense of well-being. VOYER started with the spine, but then applied the basic ELDOA principles to every joint of the body until he had an exercise for all of the joints of the pelvis, TMJ, lower and upper extremity, rib cage and the cranial bones. In late 2014, Dr. VOYER and a group of his dedicated students reorganized ELDOA training. It is now in a six-module format. THE EVOLUTIONS INSTITUTE OF SOMA INSTRUCTION IS ONE OF A VERY FEW ENTITIES AUTHORIZED TO TEACH ELDOA CERTIFICATIONS. Check this site often for our ELDOA course offerings or contact us to organize a course for your group or facility. Guy VOYER’s Soma-Therapy represents the roots of his manual medicine paradigm and is the starting point for anyone wishing to learn VOYER’s methods of treating the body. The Soma-Therapy Fellowship consists of three techniques: Osteo-Articular Joint Pumping, Fascial Normalization, and Transverse Tendinous and Ligamentous Stretching (TTLS.) Each technique is learned in a series of three consecutive courses. The Soma-Therapy Fellowship prepares the practitioner for an optional fourth year of the study of Diaphragmology. In Diaphragmology, the student learns to evaluate and treat the four cardinal diaphragms of the body: Pelvic, Thoracic, Cervico-Thoracic and Cranial. The description and treatment of the body’s fasciae is tremendously popular in today’s world of therapy and performance training (sport or health). A precise understanding of the anatomical, biochemical, biomechanical and histological constructs of the fasciae leads one to the awareness of the need for many types of treatment for the fasciae. Fasciae are made up of three constituent parts: Fibers, Cells and Ground Substance. A one size fits all approach to these three parts disrespects the complexity and primacy of fasciae as one of the four foundational tissue types in the body. An ill-timed or improperly chosen exercise or therapeutic intervention may not only be ineffective – it may even be harmful to the client/patient. In the VOYER paradigm, Osteo-Articular Joint Pumping, Transverse Tendonious & Ligamentous Stretching (TTLS) and Fascial Normalization are the three main techniques used to address the varied needs of the fascia. In 2015, Dr. VOYER authorized Dr. Murer to be the only individual other than him to teach the Soma-therapy Fellowship in the United States. Osteo-Articular Joint Pumping is the cornerstone of the VOYER Paradigm. 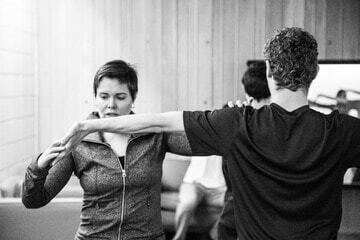 Fascial Normalization is taught in the second year of the Soma-Therapy Fellowship. Therapists who possess Fascial Normalization techniques have the ability to immediately treat the severely acute patient, finalize complex soft tissue cases and restore function to the fasciae of the viscera. TTLS is taught in the third year of the Soma-Therapy Fellowship. Diaphragmology explores how the presence of these four structures manages tension and compression in the head, thorax, abdomen and pelvis leading to complete tensegritous model of the body. The course also explores how the proper management and functioning of these structures effects function of all of the viscera in relation to the diaphragms. With the completion of all four years of the Fascia Fellowship, the student obtains a complete and detailed model of how to treat the orthopedic system. The student will also have gained an appreciation of how we are not simply a group of organ systems isolated from one another, but rather very complex, integrated beings with our health and well-being tied to the structure and function of all systems working together.